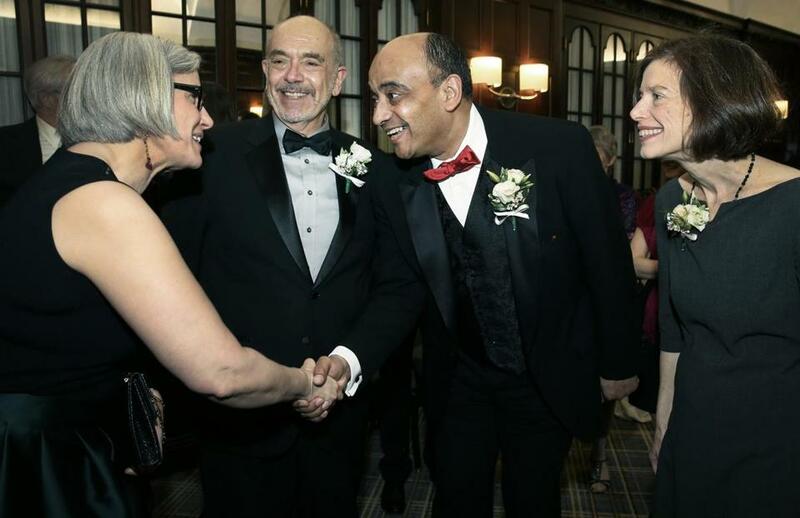 Authors and honorees Jane Kamensky, left, Wally Lamb, Kwame Anthony Appiah and Susan Faludi say hello at the the BPL’s Literary Lights awards dinner. An impressive array of writers and thinkers were feted at the annual Literary Lights awards dinner hosted by Associates of the Boston Public Library. Held at the Park Plaza Hotel, the event honoring distinguished authors from around the Northeast featured a talk by Margaret Marshall, former chief justice of the Massachusetts Supreme Judicial Court. The evening’s honorees included philosopher-novelist-professor Kwame Anthony Appiah, who was introduced by Harvard professor Henry Louis Gates Jr.; Pulitzer Prize winner Susan Faludi, introduced by “Open Source” host Christopher Lydon; author and Harvard professor Jane Kamensky, introduced by fellow historian Jill Lepore; and novelist Wally Lamb, introduced by “House of Sand and Fog” author Andre Dubus III. From left: Kamensky, Lamb, Appiah, and Faludi.